Nick Mata was born and raised in Tucson. A graduate of Rincon High School in 2010. Nick earned his Bachelor's Degree in Chemical Engineering from the University of Arizona in the spring of 2015. As a member of the University of Arizona Men's club volleyball team, Nick won 2 National Championships with the program in 2011 and 2015. In 2015 he was named All-Tournament MVP at NCVF Nationals, as well as being named first team All-Mountain West Conference. In his last year at Arizona, Nick was also involved in the University of Arizona Beach Volleyball program as a manager under Coach. Upon graduating, Nick was named the head coach of the UA Women's Club Volleyball team. In 2016, the team finished 5th place at NCVF Nationals. Nick first began coaching as an assistant to the boy's and girl's volleyball teams at Rincon/University in 2012. He became the varsity coach of the girl’s program in 2014. He was named Region/Section Coach of the Year in 2015, 2016 and 2017 while leading the team to three straight Region/Section Titles. 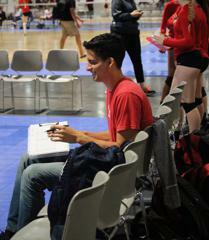 Nick is also highly involved in the boy's volleyball and sand volleyball communities. He has coached with APV boys volleyball, Desert Sand Volleyball Club, and as an assistant with CDO beach volleyball. In the Spring of 2018 Nick joined the University of Arizona Volleyball staff as the Vounteer Assistant Coach. Nick has been coaching with Zona since the 2013 club season.